Children from 6 to 11 years have 50% discount. Discounts for groups available upon request. Cesky Krumlov hotel Bellevue (former Hotel At the Town Vienna)**** is in the town historical area just a few meters from the entrance to the State Castle. Hotel is in old and registered historical building from 16th century (used to be bakery / bread shop in 16th and 17th century) and was recently refurbished (reopened in July 2002). Wellness center with sauna is available free of charge for the guests of the hotel. Massages are possible for an extra charge. Reception is open non stop and offers exchange, laundry, internet, travel and other services (golf courses possible). Conference room with capacity for 130 persons is available for holding of conferences and other opportunities. There is Le Jardin restaurant with garden and wine cellar (wine degusting possible) in Cesky Krumlov hotel Bellevue. There are 66 newly renovated rooms, offering modern accommodation in Bellevue Hotel. Room for disabled available. 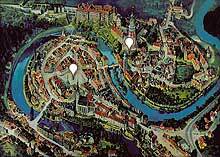 Parking is available in Eggenberg brewery (210 CZK / day), which is about 300 meters from Cesky Krumlov hotel Bellevue. Originaly Gothic building was reconstructed in the Renaissance style in half of the 16th century (first written evidence is from 1565). This burgher house was build near the gate to the Town. From the Gothic period, cellars and 1st floor of the main building preserved. Five-pettaled rose with latters „WH“ on the front Renaissance facade are from the year 1561. Interesting cross vault ceillings are on the 1st and 2nd floor. Further reconstructins took place in 1799, 1873 and 1934. Renaissance, letter-shaped sgraffito facade was renovated in 1939 and than again in 2001. Burgheres and bakers used to live here. Bread shop was operated here before the inn. Hotel building (used to called „U Mesta Vidne“ / „At the town Vienna“) annex was added in 1930´s. centrally located hotel in a quiet area of municipal park on the bank of Vltava river is one of a few with own camera monitored parking area.